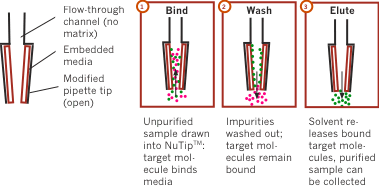 Detergent Removal NuTip enables easy separation of detergent from samples in a convenient tip format. The detergent removal media is embedded directly in the inner surface of the tip: there are no polymers, glues or matrices. This prevents contamination or permeability problems common in competitor tips. Click the button below to add the Detergent Removal NuTip to your wish list.